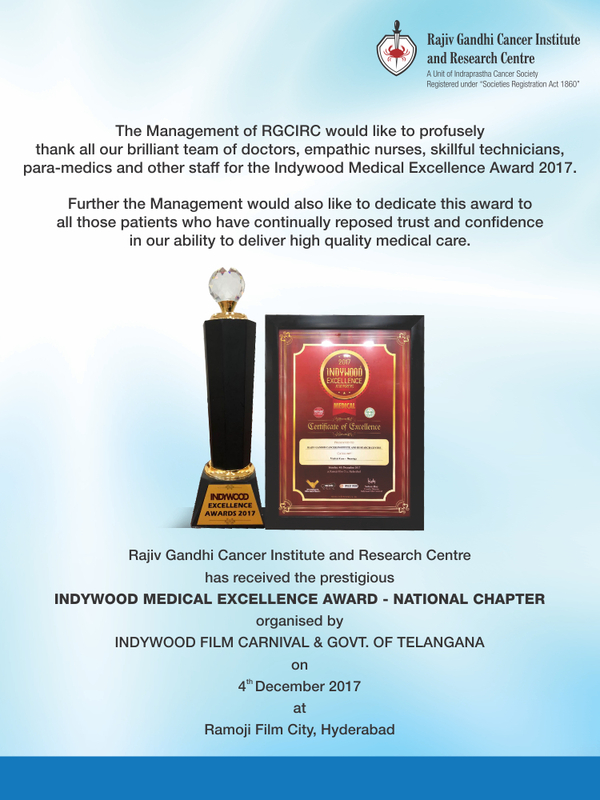 Rajiv Gandhi Cancer Institute and Research Centre, New Delhi, won the prestigious Indywood Medical Excellence Award – National Chapter, for the year 2017. This award was presented to honour the efforts and significant achievements of the hospital that contributed to improving the quality of healthcare facilities. The award function was organized by Indywood and Government of Telangana. Rajiv Gandhi Cancer Institute and Research Centre out shined in the nomination criteria for being a pioneer in their respective field of healthcare. They have been constantly providing outstanding services in their own field and constantly adapting to new approaches and technologies for betterment. This helped them evolve as a significant competitor in the health sector. “We feel proud to be honoured with such prestigious award and profusely thank my brilliant team at the hospital for this. Apart from this, we would like to dedicate this award to all our patients who have shown us their continuous trust and confidence in our ability to deliver standard medical care,” said D. S. Negi, CEO, Rajiv Gandhi Cancer Institute and Research Centre. This 302-bedded hospital in New Delhi has earlier been rewarded for the Best Cancer Care Hospital in India by National Business Leadership & Service Excellence Awards earlier this year.